Long gone are the days when people used to spend hours while maintaining their lawn or gardens. Thanks to the state of technology which has seen the design of quality commercial weed trimmers which are handy and convenient. However, to enjoy all the benefits that come along with these tools, you should invest in a quality device. But with the ever increasing number of brands in the market today, it can be challenging and time-consuming to identify your preferred machine. 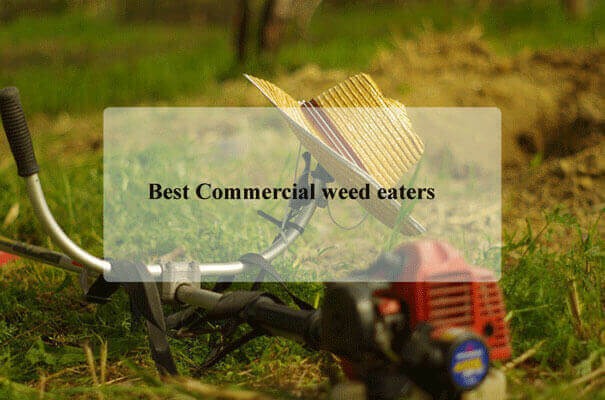 We understand how poor quality tools can impact the quality of work.That’s why we have gone a step further and carefully selected the best commercial weed eaters in the market today to help you invest wisely. But before we introduce you to our top 5 best picks, first let us have a look at what you should consider when buying your weed eater. BLACK+DECKER LST136W 40V MAX Lithium Ion String Trimmer, 13"
We cast our die and it fell on the BLACK+DECKER LST136W 40V String Trimmer. The telescopic design of its shaft guarantees superior convenience. The design also improves coverage allowing you to finish your job in record time. This commercial weed eater gets its power from a Lithium-Ion battery. When fully charged, the battery will provide you with up to 40 minutes of work. The LST136W string trimmer has many features that improve its versatility. One such feature is the PowerComand Dial. It allows you to toggle between optimum runtime at 6500RPM and optimum power at 8500RPM. The trimmer is cordless so you will not have to deal with limiting cables. The cordless design combined with the convenience of lightweight make the trimmer user-friendly. Several other features impressed us. These include an automatic pool feeder and ability to convert the tool from a weed eater to an edger. The automatic spool feeder ensures continuous work without bumping. Some people have a problem with the auto-feed system. But the technology makes trimming easier. The convertibility feature allows you to convert the weed eater to an edger. All you need to do is turn the shaft. 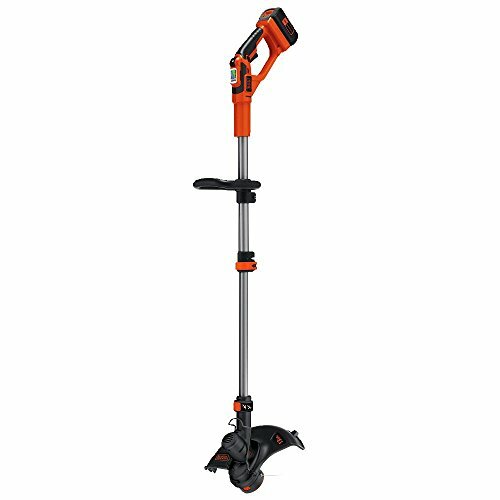 For sure, the BLACK+DECKER LST136W 40V String Trimmer will impress you too. 1. 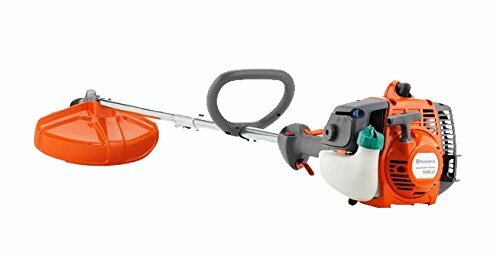 BLACK+DECKER LST136W-40-Volts MAX Lithium-Ion String Trimmer, 13"
Weed can sometimes take a toll on lawns and will require you to get rid of them early enough. Modern weed eaters are designed using the latest technology to give you the versatility you need to reach even those tough corners that are hard to reach. However, investing in a poor quality weed eater can ruin the experience and make it next to impossible. In case you are looking forward to maintaining your lawn, here is what to be on the lookout. Weed eaters are of different types in regards to the power supply option. These include gas, corded electric and battery-powered weed eaters. Each one has its benefits and challenges. The electrically powered weed eaters are handy and lightweight. However, the power cord will limit you which requires you to measure the distance. This can be a challenge especially when you are maintaining big lawns. Battery powered type offer you better mobility as compared to electric type. Similar to electric weed eaters, battery operated models are lightweight and quiet. Another plus feature which makes battery-powered string trimmers better is their portability. However, you will be required to replace the batteries when they die out. Before working on your next project, it is a good idea to get to know the battery lifespan. This will help you plan and ensure you have enough to get the job done. Gas trimmers on the other and are a great choice for demanding jobs. Though they may be noisy, and weighty, they deliver enough power to demolish thick and stubborn weeds. One thing that is worth noting is that these trimmers have two varieties of Gas engines. That is the 2-stroke and 4-stroke. The 2-stroke weed eaters offer more power and run on combustion gas and oil. However, they are noisy and may produce polluting smoke. The 4-stroke weed trimmers give less power but are still capable of undertaking bigger commercial projects. They are better choices because of low noise and less emission. Weight is one of the overlooked aspects by most people when buying weed eaters. Investing in a heavy weed eater will impact your mobility and ease of transportation. Worse still, using a heavy weed eater to maintain your lawn will drain you faster and reduce your productivity. Regardless of whether you are a home-owner or a commercial landscaper, it is crucial to buy a weed eater that you can manage working and moving around your farm. Commercial weed eaters can have either a straight or curved shaft. A straight shaft is good in that it allows you to reach out to those hard to reach edges of your lawn. If durability is what you are looking for in a weed eater then straight shafts are the best way to go. People with back problems can also take advantage of weed eaters with straight shafts. Curved shafts, on the other hand, are comfy, and offer you better control over the device, making them a great pick for demanding projects. However, people with back pains may encounter challenges using them. Though the curved shafts are lightweight, they are not flexible and may break. Compare the features and choose your preferred design. 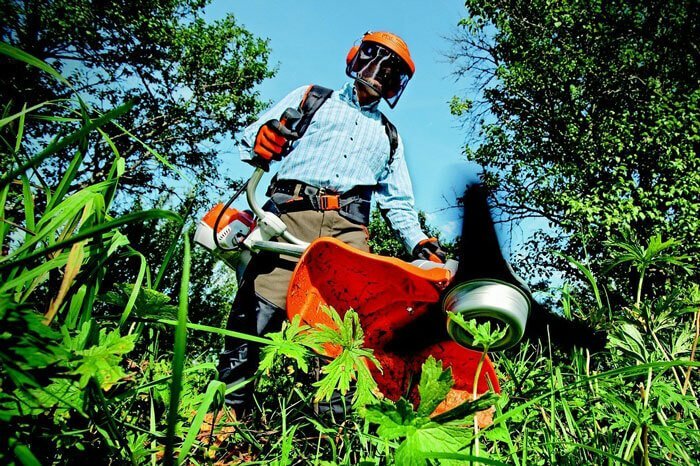 Modern weed eaters are designed using the latest technology to minimize the noise and vibration levels when on use. High noise levels and vibrations can reduce your productivity or impact your hearing. Consider investing in a quiet model with anti-vibration features. Most gas powered weed eaters feature a starting line. It is possibly most annoying and frustrating aspect of gas engines whether 2-stroke or 4-stroke. Have you been in a situation where you crank the shock but the engine won’t just start? A good way to go around this is to look for the best commercial weed trimmers with a loaded mechanism or sequential start. A sequential start defines a series of actions you will need to follow in order to start the weed eater. This means you will have to prime and set the choke and then follow a series of two or more steps. There are a few other options, which can provide you with easier and gentler starting than a line. Choose what works for you. Weed trimmers have two different head types. That is; the bump feed or a fixed-line system. Some people would prefer a bump feed trimmer. With this, you will have to bump the head off the ground to feed more line. As such, the system offers you more control over the line. It is a very simple method to use. The problem is that the spool is prone to damage and the spring worn down over repeated use. It would be great to consider the cutting path. Most regular weed trimmers usually have too small a cutting path to work well on large gardens. If you are looking for the best commercial trimmer then you should consider the cutting path. Note that the size of the cutting path of a weed eater is directly proportional to ease of use and inversely proportional to time and effort. Unlock the convenience and the power of a cordless weed eater by purchasing the BLACK+DECKER LST136W 40V String Trimmer. This battery-powered weed trimmer boasts of a variable speed dial which allows you to adjust your working speed to suit the project at hand. Its Lithium-ion battery charges in less than an hour and provides you with up to 40 minutes of action. Compared to some of the latest gasoline powered weed eaters, LST136WString Trimmer is lightweight. A great feature which gives you a better control over the device while minimizing your fatigue levels. With this string trimmer, you do not have to worry about bumping. Thanks to its automatic feed spool. The device delivers great impact required to get rid of even the tough weeds. With just a push of a button, you can easily convert your trimmer into an edger. Compared to other Cordless trimmers currently in the market, this model from BLACK+DECKER is perhaps the best you can ever find. The auto-feed mechanism is great but it may prove cumbersome to use with certain units. It's thin (0.065) line may be an issue but it is thicker than most other competitive brands. This 17-Inch commercial weed eater from Husqvarna features a dependable 28cc and a 2-stroke engine which delivers great power for optimal performance. 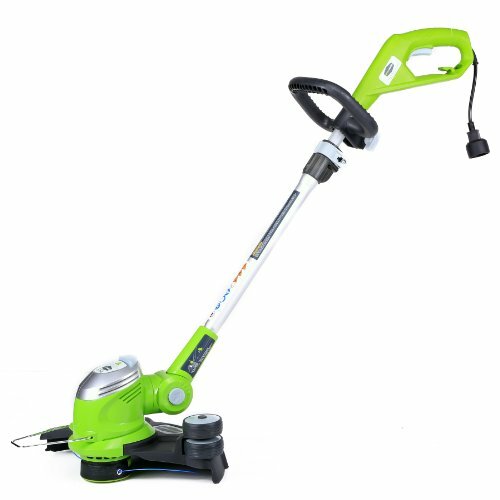 Whether you are landscaping or doing the final touches on your lawn, this weed trimmer will provide you with the great performance required to get the job done. The 10.8 gas powered trimmer touts of its smart start feature which help you turn your trimmer on without much strain. Transporting your trimmer has also been simplified, thanks to its detachable shaft. With just a push of a button, you can transform your trimmer into an edge cutter, tree pruner, hedge trimmer, sweeper, bush cutter, creeper or tiller. The engine features an Auto Return Stop Switch, which resets automatically to the ON position for hassle-free startup. Its shaft boasts of a straight design which offers fast trimming under shrubs and low bushes. We would recommend this trimmer for less demanding projects. For years now, Dewalt has put a smile on its consumers by producing superior quality products that meet the industry standards and this trimmer is not an exception. The DCST920P1 battery powered string trimmer boasts of a brushless motor which helps maximize motor efficiency and boosts its durability. Fitted to this trimmer is a Dual 0.080-inch line with bump feed and 13-inch cutting path for faster action. With this device, you do not need to strain to get the job done. Thanks to its patented gear drive which has been designed to deliver torque required without overload. The trimmer also boats of a variable speed trigger which allows you to control your working speeds to suit the tasks at hand. Through its auxiliary handle, this DEWALT trimmer allows you to have better control and improve your comfort, especially when managing bigger projects. That's not all; a 20V MAX 0.5Ah Lithium-Ion battery along with a quick charger is included in the package which allows you to get your job started right away. Husqvarna has designed yet another great string trimmer. The gas-powered trimmer delivers a four-stroke torque required for trimming thick and hard weeds. Switching on the device is a breeze, thanks to its smart start starter and engine. Its straight shaft is ergonomically designed to help increase comfort and ensure you do not hurt your back. 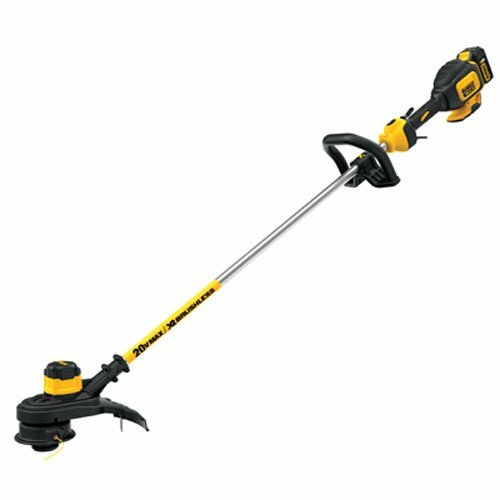 The 17 pounds trimmer is also lightweight and easy to use making it ideal for homeowners and professional landscapers. In case you may be looking for the best electric weed eater then this string trimmer from Greenworks may be a great pick for you. The trimmer is lightweight and can be used as an edger or trimmer. Integrated into this device is a powerful 4-Amp motor which delivers enough power to trim all manner of weeds leaving your compound looking its best. The trimmer is equipped with a telescopic shaft that lets you adjust or manipulate the length to fit your height. Just like the BLACK+DECKER weed eater reviewed above, this trimmer boasts of an automatic weed trimming feed system and the rotary shaft which makes it effortless to transform the tool to an edger. The string trimmer is designed to use a 0.065 dual spring. You can buy a spare pool (GreenWorks model number 29082) from various local garden centers. 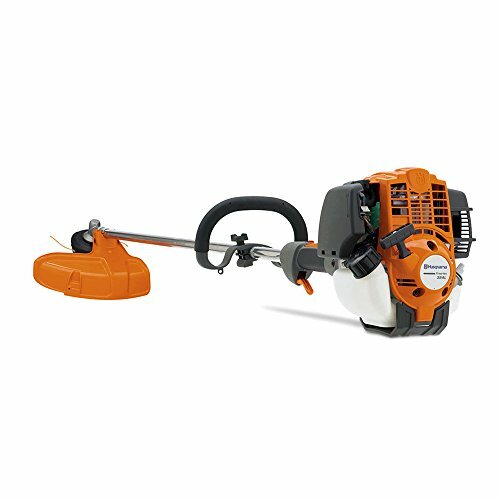 The trimmer provides a 13” cut path, which is great for residential gardening and landscaping. We believe you are now well informed and ready to take on the important step of buying the best string trimmer. From our viewpoint, the BLACK+DECKER LST136W 40Volts MAX Lithium Ion String Trimmer, 13" is the best, especially if you are looking for a cordless weed trimmer. It has some great features that set it apart from its competition. This does not mean the rest of the reviewed are not great enough to buy. They somehow have common features but a few are unique enough to make each different. In case you do not find what you need in our review then you can use the buyer’s guide provided to guide your search. Do enough research, taking into account the prices, quality and performance feature to ensure you buy the most affordable yet greatly performing model. A commercial weed trimmer offers you the best way for lawn maintenance and landscaping. Get yours today if you want to improve your living environment.